According to the National Fire Protection Association, more than 15,000 home fires per year are caused by clothes dryers. And SO MANY of these could have been prevented, according to firefighters. The solution? The right products and maintenance. One: Clean the lint filter. After every use. Teach your children how to clean it. Everyone in the house should master this super-simple preventative measure. And two: Have the ducts cleaned annually, because lint still gets past the filter even when clean. Professional duct-cleaners can spot additional dangers, and possibly save your life. 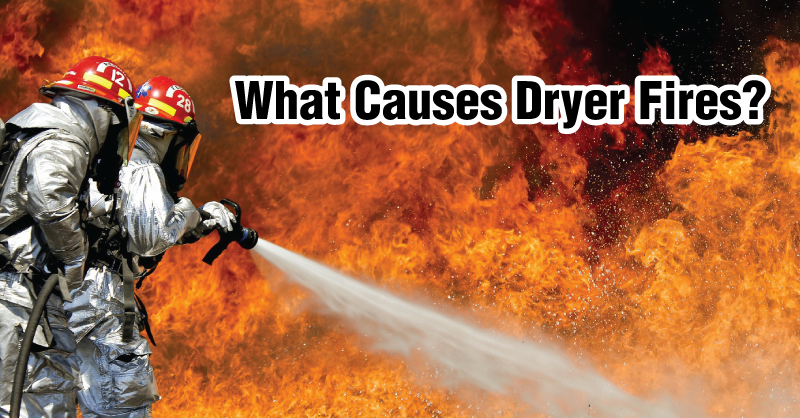 How do dryer fires happen? Lint is the leading cause of dryer fires. It’s highly flammable, and it’s everywhere. Lint naturally accumulates in your dryer and dryer exhaust system. This buildup makes the dryer work harder for each load and the lint can work its way into the heating element, which is bad news. Got a long duct run? This can accelerate the buildup of lint. If you have access to the exhaust system, venting products like the airflow-efficient Dryer-Ell can be used to replace all the restrictive elbows, making it easier to get the lint out. Less lint is good. When you push your dryer back to the wall, you may end up accidentally crushing the exhaust hose. When the dryer can’t move the air, the resulting blowback of lint is dangerous. To protect the duct, check out the Dryerbox. It allows you to push the dryer farther back, giving you the convenient space you need and ensuring maximum airflow efficiency. External venting creates pre-built “homes” for our animal friends, and they’re more than happy to move in. A cheap plastic or louvered external venting termination can be inviting for nest builders. When the duct is clogged with a nest, the lint can’t blow past, increasing the danger of fire. A good exterior closure like the powder coated, galvanized steel DryerWallVent will deter animals while providing a sleek look for your home. Don’t wait until the worst happens to learn more about the prevention of dryer fires. Educate yourself today on ways to make your laundry room safer and more efficient. Visit Dryerbox.com for even more solution-based good ideas.